All transactions are safe and secure with a reliable history in online purchasing behind each of our associates. 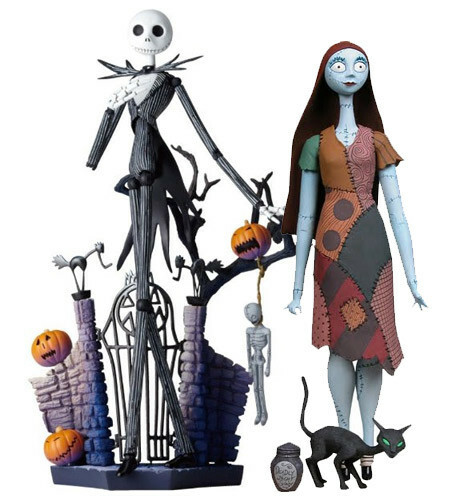 Buy the Jack and Sally Dolls, Toys and Figures to own Nightmare Before Christmas clothing and merchandise. You are never too old to play with Nightmare Before Christmas toys and action figures. Sally dolls and Jack Skellington plush figures are at the top of every Tim Burton lover's wish list, as well as any Halloween fanatic's. It is also never too early to get a young fan NBC memorablia to start off their collection right. Together, you can use these unique dolls to reenact all of the movie's most memorable moments of action, mischief and holiday splendor. In addition to the Jack and Sally Dolls, Toys and Figures above, browse the Nightmare Before Christmas Clothing Gallery for more apparel like men's and women's clothes, kids shirts or hoodies.